Last week I was re-reading the novel Wonder Boys by Michael Chabon and I was once again struck by what a good job was done adapting the story from book to film. In this author’s humble opinion, the book is brilliant. Chabon’s descriptions not only of his characters but of the city of Pittsburgh and outlying areas is truly what makes the story come to life. The reader really gets a sense of location and how that location weaves in and out of the lives of Grady, Sarah, James, Terry, and pretty much everyone else in the novel. Although the film can’t be categorized as your classic “road movie” it definitely has that feel as the characters spend a good amount of time traveling, whether it’s to a lecture on campus, a party at the chancellor’s house, Grady’s in-laws, or to rescue James Leer (from his parents/grandparents and himself). 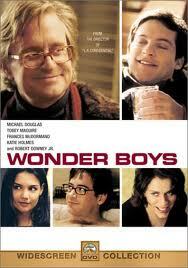 Wonder Boys takes us on a journey, exploring with richness and depth the relationships between men, women, generations, and even pets. As I was reading the novel, I was thinking more and more about the movie and how visually it really captured the spirit of the story, with particular emphasis on the use of bridges. Watching the DVD commentary, I was impressed with director Curtis Hanson and how much thought he put into using bridges as a backdrop during major scenes. I’ve since read in subsequent interviews that when he first saw Pittsburgh he was really affected by the city and especially by how many bridges there are. He felt that the bridge symbolized so much in the film for the characters in terms of getting from here to there. Growing and maturing and expanding as a person with help from the people around you who you least expect. It’s also about transitioning from who you were to who you are (or who you’d like to be). Grady is middle aged and yet faces the prospect of fatherhood for the first time. James is a young college student just starting out, feeling his way around, trying to find out what kind of man he is. These two men share with each other that feeling of being adrift in your own life and after sharing a pretty crazy weekend, they also find their way (or at least they’re a little closer to finding their way). The bridges in the movie were a brilliant addition and they serve the viewer well in taking us ‘along for the ride’. Hanson’s creativity so compliments Chabon’s writing that you wonder what it would be like if they came together for say, the movie version of Kavalier and Clay? I have read this novel and the movie looks promising. I’ll be sure to check it out. Book unreadable, but I think that the movie will be good!